The Savvy Bag’s slim & smart design has an ingenious removable pad that gives baby a clean & comfy changing or sitting area – wherever you go. Parks, picnics, cruising around town or big travels – you’ll be ready to roam. What do I love about this? Everything! I love how well thought out this product is. The bag stays shut with a two magnet closure. To open it, just lightly pull. Then the flap portion unfolds to create a diaper changing station. For smaller children, this works wonderfully while still attached to the clutch. 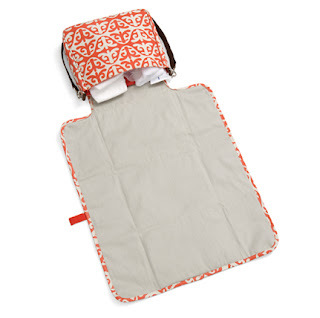 For older children, the changing pad detaches with three small snaps. The bag portion is the perfect size for a travel wipes container and several diapers. If you are looking for a full diaper bag for changing needs as well as feeding needs, this is not what you are looking for. But if you have an older child who is nearing potty training age, or need something for a quick errand this is wonderful! With Eli being 2 1/2 this is my go to bag right now. I also can use it for brief errands to the pharmacy or dollar store with my new niece. And let’s talk about the print on this, beautiful and contemporary! It catches everyones eyes and can be easily wiped off if soiled. This was definitely one of my favorite products that I have gotten to try from Infantino! I also had the chance to see all of the new things coming out from Infantino during Toy Fair. Be sure to keep on top of the new products by periodically checking their twitter, you tube, or Infantino site. To say goodbye to the Infantino Test Drive Mom program, the people at Infantino are giving one Momma D and Da Boyz reader a Facebook Page of their very own! To enter the Infantino Savvy Bag giveaway, please visit the Infantino site and tell me one other product that interests you. You MUST do this or all other entries won’t count. Please be sure that your profile has your email right on it, or be sure to leave your email address in your comment. This contest is open to US residents only. 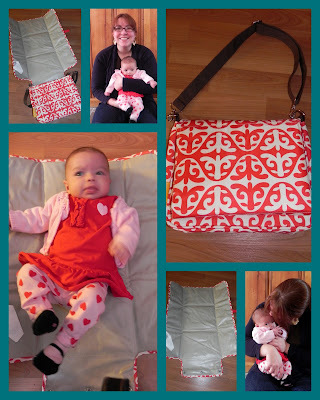 The Infantino Savvy Bag Giveaway will end at 11:59 PM on March 10th. The fold and go bouncer looks so cute!! 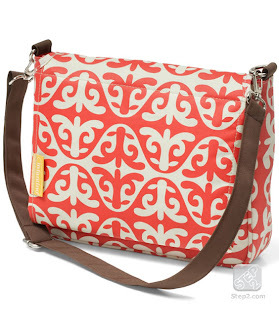 And I love the clutch…so cute and stylish!! I already like/follow u on facebook. The A Day at the fair Puzzle looks great! I love the Fold and Go travel bed! I like the Switch 2-in-1 Shopping Cart Cover. The print is good for hiding stains and I like that it fits carts and high chairs. I'd love to try the fold & go bouncer…easy to travel with! Love the Fold & Go Travel Bed! The Monkey Pod is adorable. My boys love music! My handle is Inspire Innovate. I tweeted about this giveaway. Here is the link. i also like the activity ball on their site. I like the bendy bug!